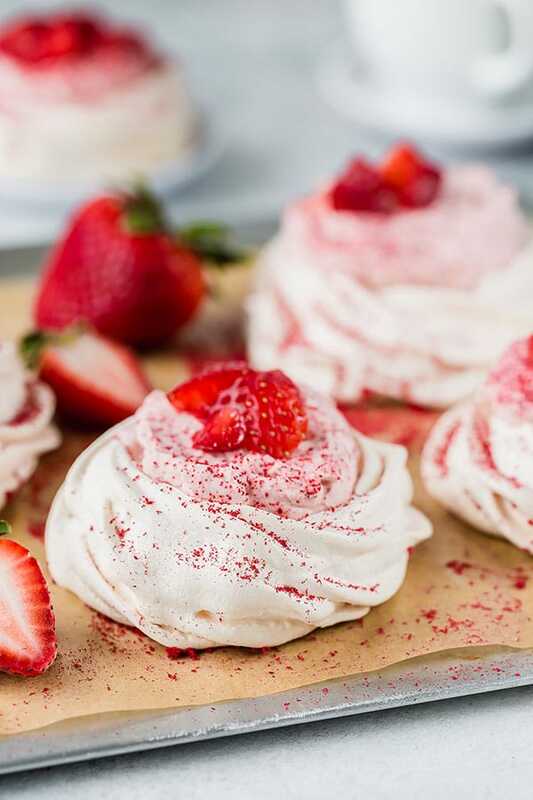 Dreamy, creamy and oh-so-delicate strawberry mini Pavlova is light and sweet mini desserts to impress your guests! 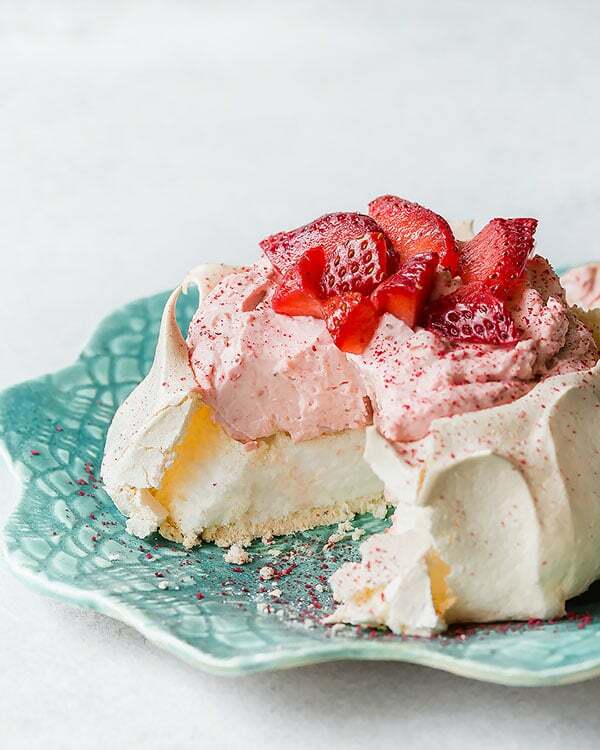 Equipped with my top 5 tips and simple ingredients, you’ll make perfect Pavlova every time. There are 2 kinds of people out there. Those who LOVE Pavlova cake. And those who have yet to try one, but soon-to-be-floored by it! Truly, these beautifully delicate cakes have that irresistible charm that no one (and I mean NO ONE) can resist a bite, and another one, and another one. If you happened to be in the second camp and not sure what I’m talking about, listen up. These are light and airy meringue-based mini cakes with soft marshmallow-y center and delicately crisp meringue crust on the outside. Topped with sweet whipped cream filling and fresh fruits, these little cakes are effortlessly impressive, yet insanely easy to make. Like I said, it’s really easy to make a Pavlova cake with just handful of simple ingredients. However, I need to share a few tips with you, so you’ll get the most gorgeous Pavlovas every time! It’s easier to separate egg whites while eggs are cold from the fridge. However, room temperature egg whites whip up bigger and better. So separate the egg whites as soon as you bring them out of the fridge, then let them sit on the counter for 30 minutes or so. I shared my process of separating egg whites in my other raspberry mini pavlova recipe. Egg whites don’t like any trace of grease, or fat. So make sure your bowl and whisk are squeaky clean and fat-free. Stainless steel or glass bowls are the best, because plastic bowls tend to absorb fat and grease. And be careful when separating those egg yolks. Even a small drop of egg yolk could ruin the meringue. Egg whites simply don’t whip into fluffy meringue with stiff peaks when they’ve been in contact with fat/egg yolk. That’s why I can’t stress this enough! Acid is another important component in perfect Pavlova recipe. It can come in different forms, like cream of tartar (dry acid), or any kind of vinegar (liquid types). Acid is what makes that soft, marshmallow-y texture in the center. I happen to use both cream of tartar and white vinegar in my recipe, but cream of tartar is optional and it acts as a stabilizer for the meringue. You can totally omit cream of tartar, if you don’t have it on hand. Or you can use 3/4 teaspoon of cream of tartar instead if you’re out of vinegar, . Make it ahead! Pavlova is NOT last minute, quick dessert. It requires slow baking and even slower cooling time, which makes it a perfect make-ahead dessert for any special occasion. I usually make mine at night after dinner. Another bonus for hot summer days, when you don’t want to turn on the oven during heat of the day. Low and slow baking is essential. BUT over the years, I learned a little trick: preheat the oven to 350°F and then reduce it to 300°F. That initial high temperature helps the cake to shape without spreading too much and creates better (stronger) crust. Just don’t forget to reduce the heat as you put the cake in! Humidity is enemy of baked Pavlova! 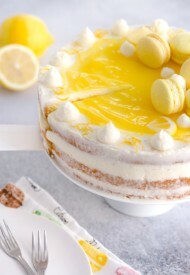 That’s why you need to assemble the cakes right before serving, or serve them within 2 hours, without refrigerating. 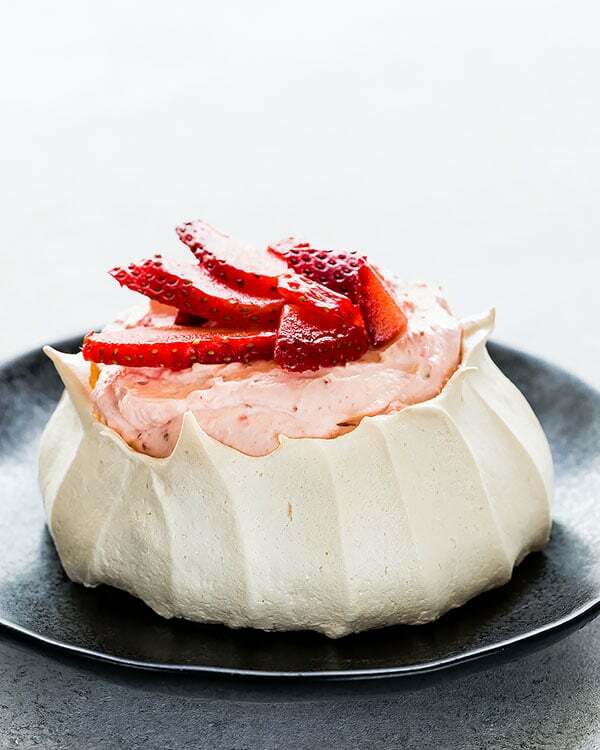 When refrigerated, Pavlova loses it’s delicate crispness and becomes gummy. If you live in a humid climate, keep the baked Pavlova in the oven overnight, or until ready to assemble. Well, I think that’s a wrap as far as tips go. But now you can enjoy some photos of the beautiful fluffy meringue (that perfect stiff peak stage! 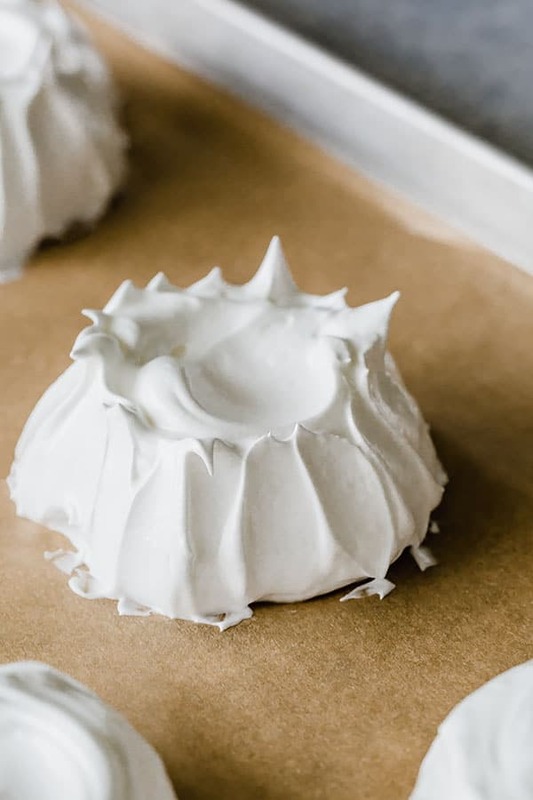 ), unbaked Pavlova mounds (different ideas for you to shape your mini Pavlova), and of course, plenty of finished (dressed up) Pavlova cakes. Here’s simple meringue mound without any special design – just as elegant! Don’t forget to make a little crate in the middle. 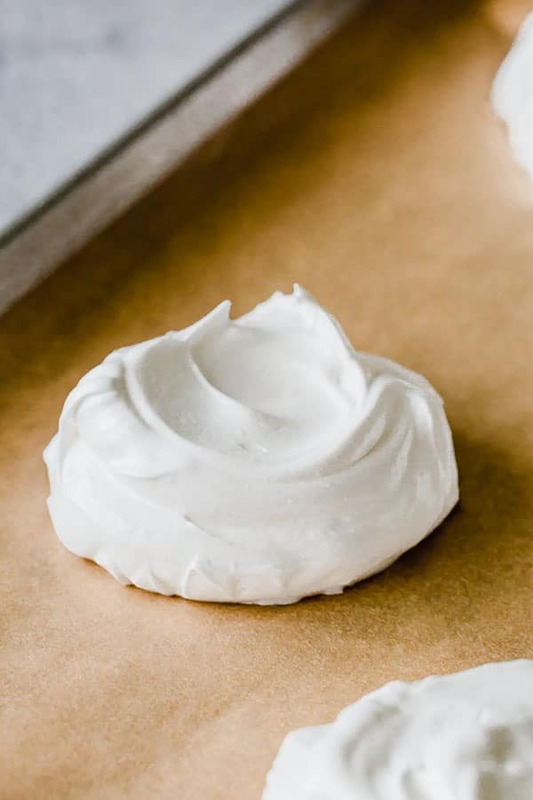 Elevate the simple mounds with this simple trick: swipe up the sides of the meringue with a back of spoon. Or place the meringue into a piping bag with a decorative tip (I used Wilton 1M) and pipe beautiful nests. Seriously, such an easy and effortless dessert to impress your company! And just look at that soft and marshmallow-y center!!! And those crisp edges are to die for! To make the Pavlova base, preheat the oven to 350°F (177°C). Line 2 baking sheets with parchment paper. In a small bowl, whisk together sugar and cornstarch. Set aside. 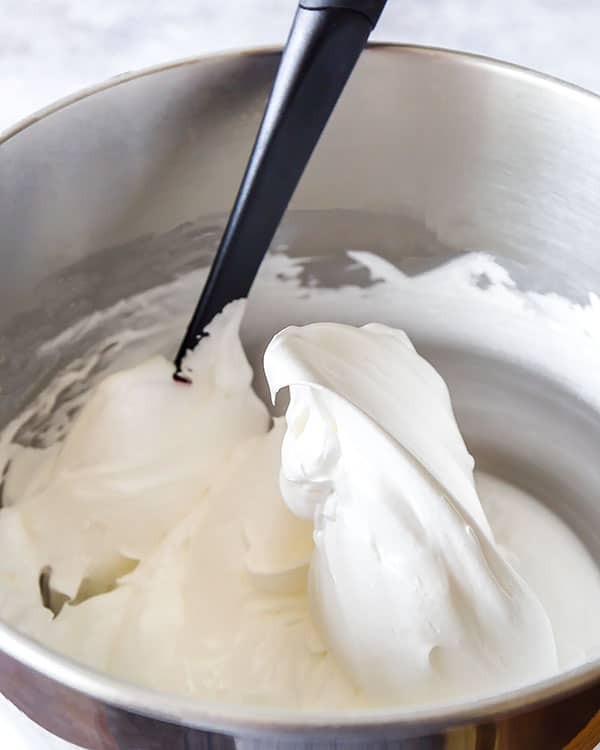 In a large clean mixing bowl with whisk attachment, or using handheld electric mixer, beat the egg whites until frothy. Add sugar/cornstarch mixture one tablespoon at a time, while mixer is running on medium high speed. Increase the speed to high and continue to beat the egg whites until hard peaks form. The mixture will look smooth and shiny. Add vanilla extract and white distilled vinegar, and gently fold the mixture with a spatula. Spoon the batter into 8 rounds on the prepared baking sheets. Make a shallow well in the center of each round. (TIP: Take a little bit of meringue batter and smear under 4 corners of the parchment paper, so it doesn’t move.) Alternatively, you can put the batter into a piping bag with decorative tip (I used Wilton 1M tip.) and pipe the nests instead. Place the baking sheets in the oven and immediately turn the oven temperature down to 300°F (150°C). Bake for 30 minutes. And then turn the oven off and let it cool for at least an hour with oven door ajar. Store cooled mini Pavlovas in air tight container at room temperature, or in the cooled oven until ready to assemble. To make the strawberry whipped cream filling, run the freeze-dried strawberries in a small food processor until powder. Or you can place the fruits in between 2 parchment paper sheets, and roll with a rolling pin until fine powder. Reserve a tablespoon or so of strawberry powder for dusting. Pour cold heavy whipping cream in a mixing bowl. Beat the cream on low speed (speed 2 or 4 on stand mixer) until slightly thickens. Add sugar and prepared strawberry powder. Continue to mix on medium speed (speed 4) for a minute or two. You can increase the speed to 6 on stand mixer until the mixture reaches hard peaks. Keep a close eye on it, you don’t want to over-beat it, or it’ll turn into sweet butter. 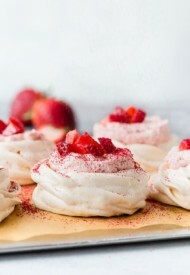 To assemble the treats, fill the Pavlovas with strawberry whipped cream filling and top with fresh strawberries. 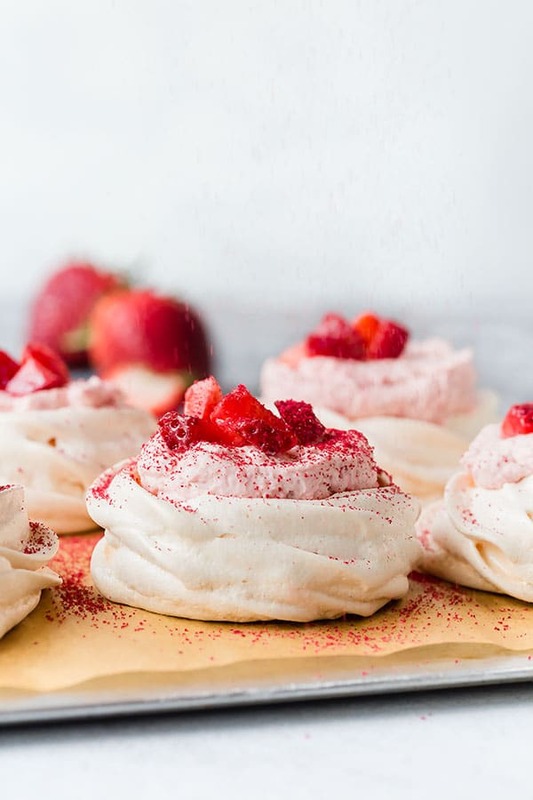 If desired, dust the assembled Pavlovas with reserved strawberry powder. Serve immediately, or within 2 hours. 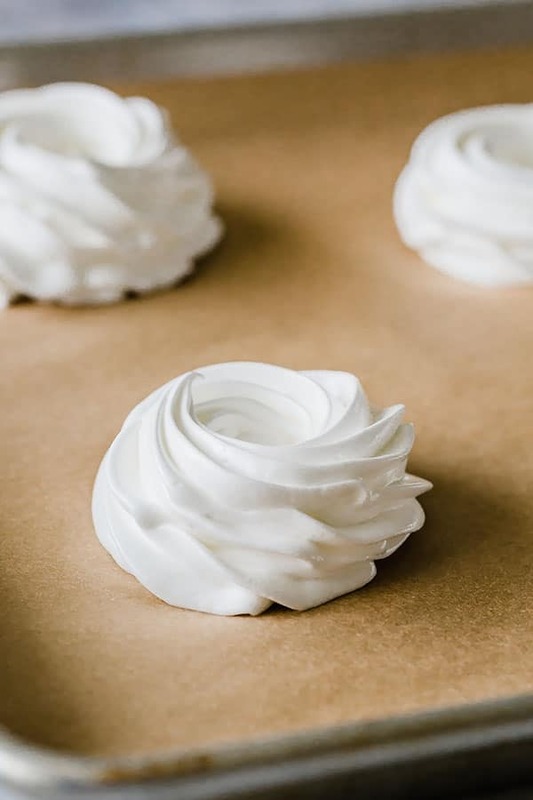 Make-Ahead Tips: You can prepare Pavlova base and whipped cream frosting 1-2 days in advance, but store them separately. 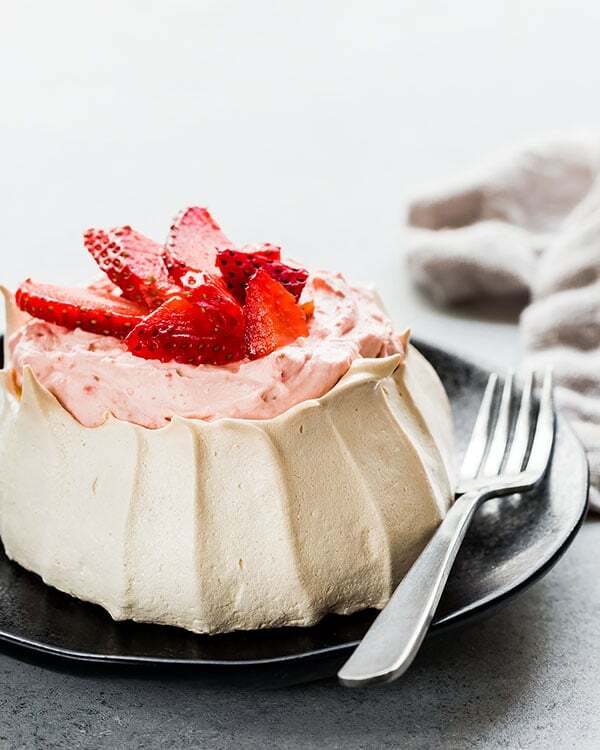 Keep Pavlova base at room temperature, away from humidity. Store the strawberry whipped cream frosting, covered, in the fridge. When ready to assemble, bring out the frosting 30 minutes prior to assembling. If the frosting is too stiff, whip it with 2-3 tablespoons of fresh heavy whipping cream until nice and fluffy. Egg Yolk Recipes: With leftover egg yolks, you can make rich homemade ice cream, homemade pudding, all-butter pie crusts, egg yolk cookies, and/or crème brûlée. All photographs and content on Sweet & Savory by Shinee is copyright protected, unless otherwise noted. Please do not use any of my photos without my authorization. If you would like to share my recipe, you may re-write the recipe in your own words, or simply link back to this post for the full directions. Thank you for your cooperation! Subscribe and receive my FREE Portion Planning Cheat Sheet for Cocktail and Dinner Parties. Hi, I’m Shinee. Here on my blog, I’m committed to making made-from-scratch gourmet easy and approachable. My detailed tips and step-by-step photos make each recipe easy to recreate and are sure to impress at any occasion. ©2013-2019 Sweet & Savory by Shinee. Design by Purr.